The Vin Baker story is one that has become all too familiar when it comes to professional sports. A player has a 13-year career, makes a cool $100 million along the way, and within a few short years after retirement he is broke and struggling to get by. However, in the case of Vin Baker, he is not exactly struggling. He's got a job at Starbucks. Actually, he is training to become a manager. "In this company there are opportunities for everyone. I have an excellent situation here at Starbucks and the people are wonderful," Baker says. Baker thanks Starbucks CEO Howard Schultz, who once owned the Seattle Supersonics (Baker played for them from 1997-2002), for giving him the opportunity. It is easy to look at Baker, shake your head, and dismiss him as another NBA cautionary tale. Here he was given the kind of talent that allowed him to earn enough money to live a very comfortable life and to provide well for his family (he is married with four kids). Instead, he is going to have to make anywhere from $36,000 to $71,470 a year working (average is $48,697). That's kind of a big difference. So – what happened? Baker did enjoy living the life. He was arrested for driving under the influence in 2007 and admitted to battling alcoholism in a 2010 interview. In his mind, a good part of the blame lies with his former financial adviser, Brodeur & Co. Certified Public Accountants. He is suing them for mismanaging his finances from 1997-2009, costing him his $86 million nest egg in the process. "When you make choices and decisions and think that it will never end, and then you get into spending and addiction and more spending, it's a definite formula for losing. If you don't have perspective in your personal life and you don't understand what this $1 million or $15 million means, it will go." Things got bad enough for Baker that his house was foreclosed upon and he was forced to liquidate other assets in order to meet financial obligations. Baker has also owed over a million dollars in back taxes, and has had a number of other properties enter foreclosure. Unfortunately, Vin does not have a $30 million trust fund from Reebok like fellow former NBA star Allen Iverson. So if you happen to be in North Kingston, Rhode Island, and find yourself thinking that the barista behind the counter at Starbucks is really, really tall, chances are you are having your coffee poured by former four-time NBA all-star and Olympic gold medal winner, Vin Baker. 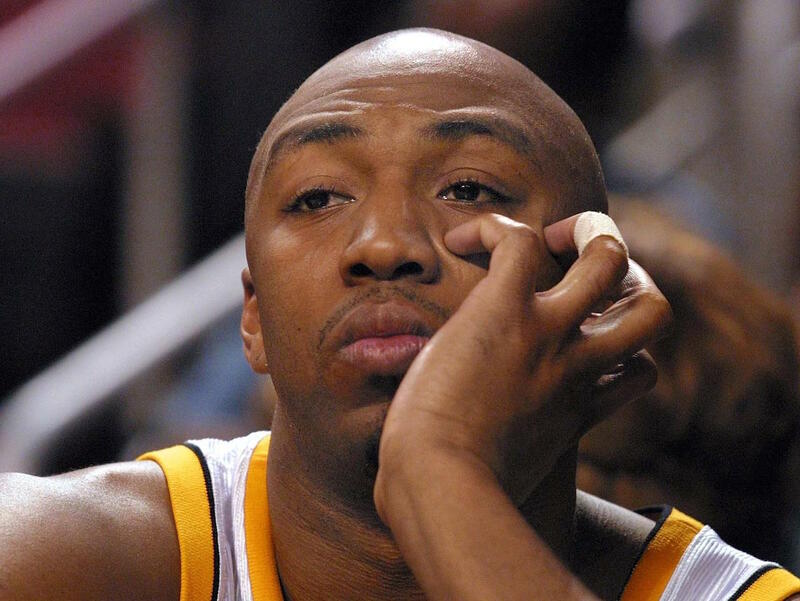 Despite a productive 13-year career in the NBA, Vin Baker lost all of the money he made. When his life reached rock bottom, here's how he started to turn it around. Some of the NBA's highest earning superstars have somehow managed to blow through hundreds of millions of dollars off the court. Here is a list of the 10 most prominent NBA players who have had some serious money troubles. If you add up all the contracts that have ever been paid in the NBA, which player has earned the most in cumulative salary? The results may surprise you!